Did you know that the Emotive project collaborates with several major European Research and Technological Development initiatives? Throughout the project we’ll be drawing on the experiences of the CHESS, MAGELLAN and PLUGGY projects as we research and develop the prototype Emotive software platform. MAGELLAN (http://www.magellanproject.eu/) is coordinated by Emotive partner EXUS and DIGINEXT SARL (DXT) also participated in the project. Its vision is to establish a web platform for cost-effectively authoring, publishing, executing, and experiencing location-based games featuring Augmented Reality and Virtual Reality. The project is based on the CHESS platform, but extended to author mixed reality games that take place in the real world and involve multiple participants. Emotive aims to extend Magellan by bridging the gap between both forms of experiences: single- and multi-participant as well as supporting adaptation of experiences involving groups of visitors. The CHESS project (http://www.chessexperience.eu) was coordinated by Emotive partner DIGINEXT SARL (DXT) and the University of Athens also participated in the project. 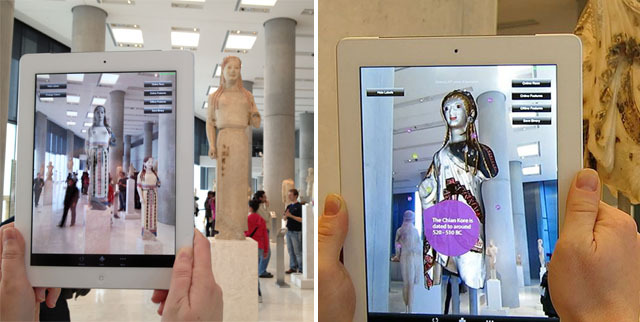 CHESS implemented a system for the authoring and experiencing of non-linear, location-based story-like experiences for museum visits. Emotive aims to draw on the research and findings from this work to author experiences involving groups of visitors through capturing real-time interactions within these groups. PLUGGY (https://www.pluggy-project.eu/) provides a social platform and a series of pluggable applications that aim at facilitating a continuing process of creating, modifying and safeguarding heritage where European citizens will be consumers, creators and maintainers of cultural activities. It enables users to access content ranging from localized specific content to comprehensive personalized stories and to experience Virtual Exhibitions through applications, covering a variety of technologies from Augmented and Virtual Reality to collaborative games for mobile devices. The Pluggy team is organising the 1st International Workshop as part of the INTETAIN 2017 conference, June 20–22, 2017 in Funchal, Madeira, Portugal. The Paper Submission deadline is 14 April 2017. Find out more here.